Argan oil has antibacterial and anti-inflammatory properties that are very effective for fighting acne. It also balances the production of fat and cleans your pores. Argan oil is a natural product that comes from argan tree seeds. This tree comes from the southeast of Morocco. It’s a natural source of vitamins and essential amino acids. They give your skin a wide range of benefits that keep it looking young and healthy. Because of its composition, this oil has also been used as a medicine. Currently, it’s very popular around the world for its various cosmetic applications. Its absorption stimulates cellular regeneration. At the same time, it creates a protective barrier against some infectious agents. These can proliferate on the surface of your skin. If that wasn’t enough, its vitamin E and its antioxidants counteract the negative effects of free radicals. They also help prevent premature aging. 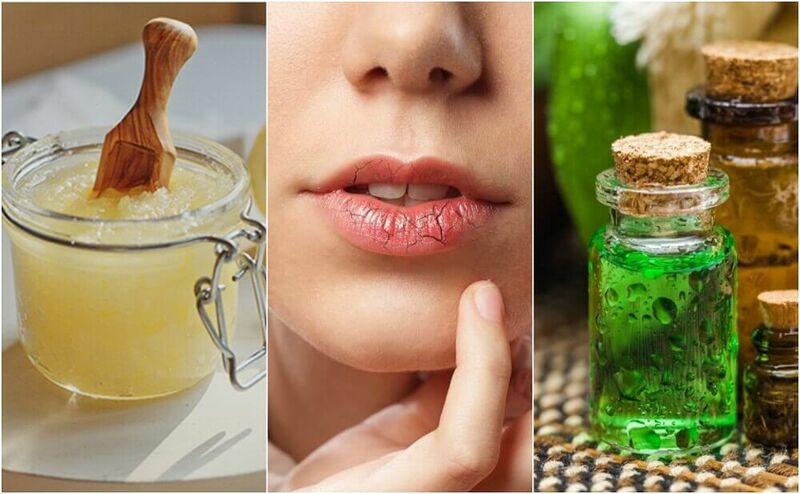 In this article, we want to share 7 interesting ways to benefit from its properties to beautify your skin. One of the most interesting characteristics of argan oil is that it has the ability to absorb leftover skin oil. This is different from other oils. This means that it’s a good option for people whose sweat glands produce more oil than normal. After washing your face with water and a gentle soap, take three drops of argan oil. Apply them on the areas of your face you want to clean. Use smooth circular motions until the oil completely absorbs. To finish, remove the excess oil with a smooth cloth. 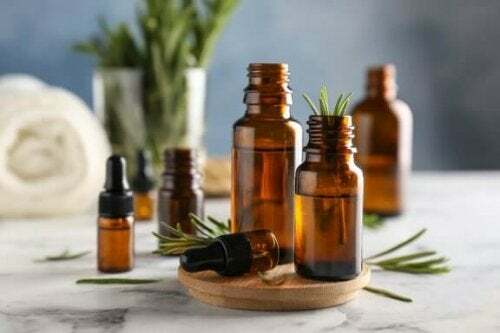 Its texture is different from other essential oils. However, this oil is a great alternative for hydrating your skin without using harsh chemical products. Its essential fatty acids and antioxidant compounds help to keep in natural moisture. This relieves dryness and regulates your skin’s pH level. Take a small amount of argan oil. Rub it on the areas of your body you want to moisturize. Be sure it absorbs well. Vitamin E and the essential fatty acids found in argan oil are a great alternative to lip balms. This nutritional makeup creates a protective barrier against external attacks. It also helps to keep the delicate skin on your lips hydrated. Moisten your fingertips with a little argan oil. Rub it on your lips until it completely absorbs. Use it every day before putting anything on your lips. The antibacterial and anti-inflammatory properties in this oil are good for effectively fighting acne. Thanks to its characteristics, it has an interesting effect on cleaning your pores. It also helps balance your oil production. Put a little argon oil on a cotton ball. Apply it directly to your pimples or acne. Be sure to get them wet with the oil. Let it work for 20 minutes. Rinse with warm water. Repeat this treatment 2 times per day. This natural ingredient is also a good option for removing cosmetics every night. In fact, it helps to get rid of dead skin cells and other impurities that stay in your skin over the course of the day. Combine equal parts of argan oil with olive oil. Rub it everywhere you want to remove makeup. Let it work for 5 minutes. Take off any excess with warm water. 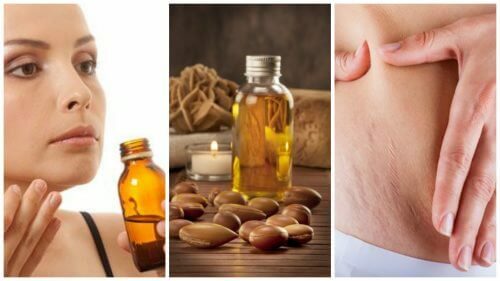 The high levels of vitamin A and E in argan oil are very helpful for preventing and reducing stretch marks. These compounds increase the elasticity of your skin. They also stimulate cellular reparation and prevent the breaking of fibers. Take a little argan oil in the palms of your hands. Rub it on areas that are likely to get stretch marks. Use gentle massages for 5 to 8 minutes. Then, rinse with warm water. Use it at least 3 times per week. Because of its fatty acid and antioxidant compounds, this product is an effective solution for reducing fine wrinkles like crow’s feet. These nutrients stimulate the production of collagen and elastin. These are two essential substances that keep your skin young and firm. Put several drops of argan oil on your fingertips and rub them on the corners of your eyes with a light massage. Be sure that it absorbs well. Repeat this treatment every night. Try it! We know you’ll love it. Wikipedia, la enciclopedia libre. (Consulta 2018). ESTRÍAS. Online [https://es.wikipedia.org/wiki/Estr%C3%ADa]. Wikipedia, la enciclopedia libre. (Consulta 2018). PIEL. Online [https://es.wikipedia.org/wiki/Piel].